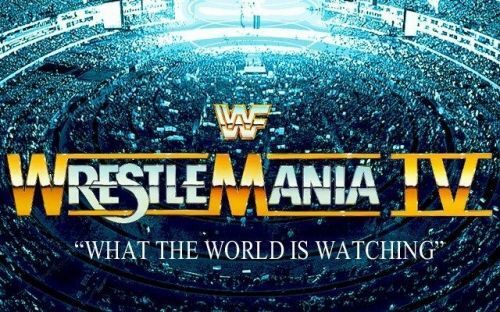 WrestleMania 4 was built around the tournament for the vacant WWF Title. The fourth WrestleMania was held at the Trump Plaza in Atlantic City, New Jersey. The event was centred on the tournament for the vacant WWF Championship. Leading into the event, Andre the Giant had defeated Hulk Hogan for the title and handed it to Ted DiBiase. However, Jack Tunney vacated the title as he said that the title could only change hands in a wrestling match. Hulk Hogan and Andre the Giant, as the previous two champions were given a first-round bye, but would face each other in the quarterfinals. The event itself started with a 20-man battle royal for a trophy. Sam Houston was the first man eliminated, and he was followed quickly by Sika, while George 'The Animal' Steele started and spent the majority of the match on the outside of the ring. Steele would eliminate Jim Neidhart by pulling him out by the beard. The Bolsheviks and Bret Hart would team up to eliminate Hilbilly Jim, meanwhile, Steele was sent away from ringside by the referee despite never entering the ring or being eliminated. The Junkyard Dog and Harley Race renewed their rivalry from WrestleMania 3. Junkyard Dog would eliminate Harley Race with the last three coming down to the face Junkyard Dog against the heel pair of Bret Hart and Bad News Brown. The heels would eliminate Junkyard Dog with Hart and Bad News celebrating in the ring. Brown would then turn on Hart throwing him around the ring before eliminating him. Hart would then come back into the ring pushing Bad News Brown out of the ring and destroying the trophy. Following the battle royal, the first round of the tournament began with the first match taking place between Jim Duggan and the "Million Dollar Man" Ted DiBiase. Duggan would control the start of the fight, but DiBiase would swing the momentum his way. Later in the match, Andre the Giant would trip Duggan as he hit the ropes. DiBiase would take advantage of the distraction, hitting Duggan from behind and pinning him to advance to the next round of the tournament. Dino Bravo would face Don Muraco, who was accompanied to the ring by former WWWF champion Superstar Billy Graham. Both wrestlers looked quite bloated and moved slowly during the match. Bravo would hit Muraco with a Piledriver, but would only get a two count. Bravo would try to hit Muraco would the Piledriver again, only for Muraco to reverse it into a Back Body Drop. Muraco would win by disqualification as Bravo pulled the referee into Muraco's path as he came back off the ropes to hit a forearm. The first round of the tournament would continue with Greg Valentine facing off against Ricky Steamboat accompanied by his son, Richard Jr. Steamboat's son would wrestle for the WWE's developmental territories in FCW and NXT before suffering a career-ending injury. The Dragon started the fight quicker, relying on his speed and agility to get the better of Valentine. Valentine would kick out of all of Steamboat's early pin attempts at the one count before Valentine got any moves of his own. During the match, the camera would cut to future WWE Hall of Famer and current US President, Donald Trump. Meanwhile, Valentine would try multiple times to lock in the Figure Four Leg Lock, but Steamboat would counter it every time before Valentine could get it locked in. Valentine would win after Steamboat hit him with a High Crossbody from the turnbuckle, but as Steamboat went for the cover, Valentine would flip Steamboat over and pin him with a handful of tights. Another first-round match was between Butch Reed and Macho Man Randy Savage. Reed would control the start of the match, keeping Macho Man grounded. However, Butch Reed would get distracted by Elizabeth at ringside as he climbed the turnbuckle. Savage then caught Reed and hit him with an elbow drop from the top rope for the victory in a quick fight. This would be followed by another first-round clash between the One Man Gang and Bam Bam Bigelow, both of whom were making their WrestleMania debuts. Bam Bam Bigelow would dominate the start of the match but would tumble out of the ring as the One Man Gang's manager Slick would pull down the rope. One Man Gang would hold Bigelow out of the ring, allowing for the referee to count to 10, awarding the match to the One Man Gang by count out. The final first-round match saw Jake Roberts taking on Ravishing Rick Rude, with the winner set to face One Man Gang in the Quarterfinals. Rude and Roberts would trade momentum back and forth, with a series of holds and slams. The crowd was solidly in Roberts corner, chanting DDT several times throughout the match. Roberts would signal for the DDT only for Rude to slip out of the ring. Heenan would distract the referee, allowing for Rude to choke Roberts. However, Roberts would fight out of Rude's submission, but Rude would control the match as Roberts appeared tired. Roberts would still manage to kick out on all of Rude's pinfall attempts. Roberts finally managed to fight back, hitting Rude with several moves before once again going for the DDT, but Rude would once again slip away. Rude and Roberts would both go down as they clotheslined each other. Roberts would recover slightly early, but as he went to attack Rude, Rude would perform a double leg takedown. Rude went to pin the felled Roberts with his legs on the rope for leverage. However, the bell would ring as the referee hit the two count. After some confusion, the referee would call the match a time-limit draw meaning both men would be eliminated. In the gap between the first round and the quarterfinals saw Hercules face off against the Ultimate Warrior in his WrestleMania debut. Hercules would try to go for the Full Nelson submission, but couldn't lock his fingers. Warrior would push himself into the turnbuckle and landed on Hercules. With both men's shoulders on the mat, the referee began the count. Warrior would get his shoulders off the mat, meaning that Hercules would lose the match via pinfall. Hercules was outraged and attacked the referee before getting his chain and tried to wrap the chain around the Warrior's neck. Warrior would block the attempt, getting his fingers in between the chain and his neck. Warrior would then get the chain and attempt to use the chain against Hercules, but Hercules would slip away from the ring to avoid the swinging chain. The first match of the Quarterfinals would see former WWF champion Hulk Hogan face off against Andre the Giant in a rematch of the main event from the previous year's WrestleMania. The giant attacked Hogan even before the first bell had rung for the match. DiBiase would climb on the apron only for Hulk Hogan to catch him. Andre would the get caught on the ropes as Hogan posed around the ring. Andre would quickly take control of the fight choking Hogan out, only to release Hogan by the 5-count each time. DiBiase would bring a chair in the ring as Virgil distracted the referee. Hogan managed to catch DiBiase and would take the chair away from him. Hogan would then hit Andre with the chair. Andre would then take the chair off Hogan and hit him with it as well. the referee would then call the match over via double disqualification. Despite the fact that Hogan had clearly struck Andre with the chair first. This would leave the winner of Ted DiBiase and Don Muraco to get a bye in the semi-finals. Their match was next with Muraco coming out first once again accompanied by Superstar Billy Graham, while DiBiase came out without Virgil or Andre. Muraco would get the jump on the Million Dollar Man attacking him before the bell rang. DiBiase would slingshot Muraco into the corner to gain the advantage, but would later miss an elbow drop from the turnbuckle. Muraco would have the advantage for a bit after that, but as he came off the ropes, DiBiase would hit him with a Stun Gun on the ropes and pin Muraco for the win to advance to the finals. The final Quarterfinal saw Greg Valentine face off against the Macho Man Randy Savage, the winner would go on to face the One Man Gang in the Semi Final. Valentine controlled the start of the match, but Macho Man fought back hitting an Axe Handle off the top rope. Macho Man would go for it a second time but would be caught by Valentine in the stomach. Valentine would then go to lock in his Figure Four Leg Lock. Macho Man would counter the attempt into a Small Package Cradle pin for the three-count. The first title of the match would see the Honky Tonk Man defend his Intercontinental title against Brutus "the Barber" Beefcake. The momentum would sway back and forth as Honky Tonk would use the assistance of his manager Jimmy Hart and valet Peggy Sue to gain the advantage. Honky Tonk Man would go for the Shake, Rattle, and Roll finisher, but Beefcake would grab onto the ropes. The Beefcake would then hit the Honky Tonk Man with a Back Body Drop and locked in a Sleeperld. The Honky Tonk Man would appear to fade, only for Jimmy Hart to attack the referee with his megaphone. Beefcake would win the match via Disqualification which meant Honk Tonk Man would retain the title, but Beefcake managed to sheer off some of Jimmy Hart's hair while the referee and Honky Tonk Man were grounded. Next up was a six-man tag team match between Bobby Heenan and the Islanders against the British Bulldog and Koko B Ware. The match stemmed from the Islanders and Heenan kidnapping the British Bulldog's mascot Mathilda. Heenan wore an attack dog trainers coat, supposedly to protect him from Mathilda's bite, but it did not stop the Brain from scampering from the ring when the Bulldogs got to the ring. Dynamite Kid would start in the ring with Tama of the Islanders, and the Dynamite Kid would get the advantage before Tama would tag in Haku. Bobby Heenan would come in for the tag when the Islanders had Davey Boy Smith on the ground but quickly tagged himself out when Smith caught him with a shot to the gut. Once again Heenan would get back in the ring with Koko B Ware grounded. However, this time when Koko B Ware caught Heenan he wasn't able to get himself out. The Islanders would run interference and attack Koko B Ware from behind. This would bring all 6 members in the ring. Heenan would pin Koko B Ware after a splash for the win. After the match, the Bulldog's would sick Mathilda onto Heenan as he tried to make his way up the ramp. Ted DiBiase would be in the ring as they announced he would be in the final, with only the Semi-Final remaining between the One Man Gang and Macho Man Randy Savage. The One Man Gang came off a bye in the Quarter-Finals, while Savage wrestled Greg Valentine. Naturally, the One Man Gang would use his power game to dominate the start of the fight. The One Man Gang would hit Macho Man with a series of body slams but could not get more than a two-count. The One Man Gang would take Slick's cane and use it against Macho Man with the referee distracted. Eventually, the referee would turn around with the Gang still using the cane and would call for the bell. The penultimate match of the card would be for the Tag Team titles between Demolition against the reigning champions of Strike Force. Demolition Smash would start for the challengers would face off against Rick Martel for the tag champions. The match would quickly breakdown with all four men in the ring as Strike Force would manage to get a double team on Smash. Strike Force would frequently target the left arm of both members of Demoition. Demolition would turn the tide after catching Santana would get caught in a bear hug. Ax and Smash would then keep Santana isolated in their corner, using frequent tags back and forth to keep swapping out each participant. Santana would eventually get a hot tag to Martel after hitting Ax with a flying forearm. Smash would get caught in the Boston Crab by Martel and Mr. Fuji would climb onto the apron. While the referee was distracted, Ax would use Mr. Fuji's cane to break up the Boston Crab, resulting in Smash landing on the fallen Martel. The referee would then count the pin to crown Demolition the new Tag Team Champions. The final match of the evening and the main event of WrestleMania 4 saw the final of the WWF Title Tournament between Macho Man Randy Savage against the Million Dollar Man Ted DiBiase. DiBiase would gain the early advantage as Savage not only had to contend with DiBiase in the ring but also had to deal with the presence of Andre the Giant who was outside the ring and continually tried to attack Savage. Elizabeth, on orders from Savage, would go to the back and return with Savage's former rival and tag team partner Hulk Hogan to even the odds. Towards the end of the match, Hogan would hit DiBiase in the back with a steel chair as the referee was distracted by Andre the Giant on the outside. Savage would take advantage of the downed Million Dollar Man to hit his Top Rope Elbow Drop to win his first ever WWF title.